Moving in together is great: you have someone to share your life with -- not to mention splitting the bills! Sharing your space though? Not always so easy. When it's time to mix two styles together, here are some tips for creating a decor scheme that everyone can not only live with, but love! Besides making the physical process of moving easier, starting by cutting back (especially on decorative clutter) will help make a decor merge so much smoother. So it's key to only bring your best pieces with you. If you wouldn't stick up for an item to be used or displayed, it's probably time to let it go. Try: Taking any items you can't agree on and ranking them in order from must-stay to gotta-go. This will help reveal which items you each feel the strongest about so you can compromise where it counts. 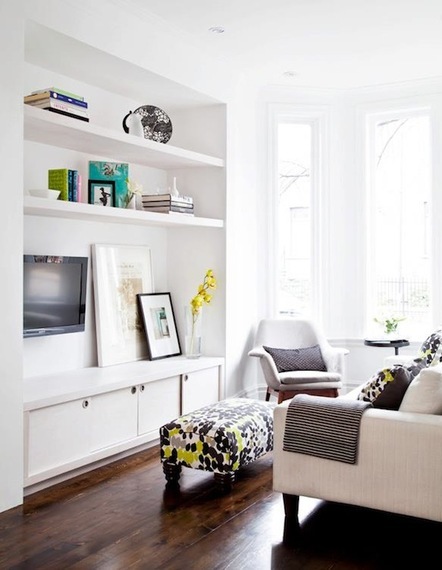 Try: Using open shelving to surround the screen while keeping the TV safely anchored directly to the wall. To help two disparate colour schemes come together, choose one hue to dominate each room, and let the others become an accent. For example, if you have a blue chair and a red sofa, you can help these two fit together by repeating one shade (usually the tamer colour) in other areas to establish dominance -- in this example, try a blue paint colour, or navy cushions and accessories, to let blue become the anchor of the room. Try: Searching on blogs and in magazines for a room with those colours together, and notice the neutrals used to connect them. If your newly shared belongings are too colourful to form a simple two-or-three-hue palette, white, grey and light neutrals are your key to tying the look together. By mixing fresh neutrals with a playful variety of hues, you can create a look where no one colour dominates or clashes. Try: Using a painting for inspiration of what items to feature or hide away, or even create one yourself with paint samples applied in simple stripes or wild splatters. Or, actually, bring a gallery home! 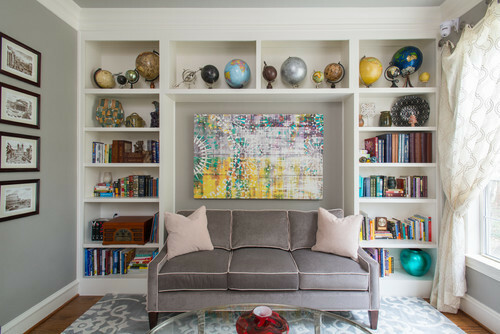 Gallery walls remain a strong, fun trend, so take advantage and mix different pieces of art and objects together on one wall for an artistic statement that reflects both of your passions. 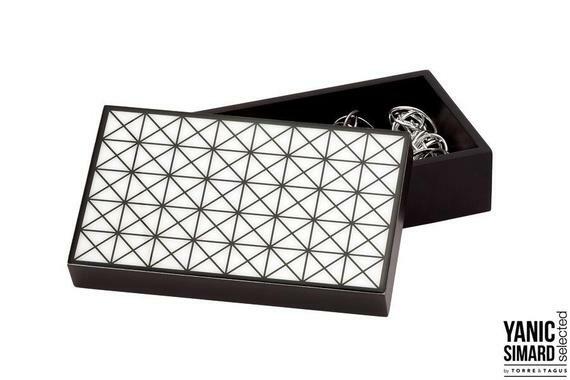 Try: Tying the pieces together with matching frames for a more streamlined look -- painting each out to a matching white or black is an easy DIY option. Mixing the best of two furniture worlds might result in combining some pieces that don't "match," but this can add to the beauty, interest and personality of a space by creating playful asymmetry. Anchor a grouping with a central object like a bed or sofa, and let smaller pieces like tables and lamps play against each other in eclectic styles. Try: Two different pieces as nightstands (like a side table and a chair, or a dresser and a desk). To balance masculine and feminine energies (a good strategy for any space regardless), balance heavy anchor pieces like leather lounge chairs, wooden chests, and moody rugs with lighter elements like sheer curtains, sparkling lights, and pretty pillows. Try: Keeping the masculine edge mostly lower to the ground, and feminine appeal up on the walls and ceiling, for a visual balance of heavy and light that our eyes automatically "get." Sometimes if styles just don't match, a good option is to give each person at least one space where one can make all the decisions. That way each of you maintains a sense of control, and not every decision turns into a total compromise where nobody is satisfied. Try: Letting one person decorate the bedroom while the other styles the den or bathroom (so everyone has one calm space just the way they like it). Got a shared space success story? Let me know on Twitter or Instagram (@yanicsimard), and visit tidg.ca/interiors for more design inspiration!